With gorgeous, long wavy layers, this SmartLace wig gives you model tresses. Enjoy endless styling options with a lace front and monofilament cap construction. Jon Renau is proud to introduce SmartLaceâ"¢, the most innovative lace front wig collection available. Super stylish and unbelievably natural, each SmartLaceâ"¢ wig is hand-crafted with the utmost quality and attention to detail. 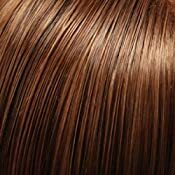 This superior craftsmanship, the key characteristic of the Jon Renau family, gives all SmartLaceâ"¢ wigs true-to-life shape, long lasting comfort, and unlimited stylability. SmartLaceâ"¢ will revolutionize the way you feel in a wig. Seamlessly Contours Without Tape - This finely woven and welded lace front will conform to the shape of your head allowing for maximum styling versatility and the most secure fit possible. Unparalleled Comfort and Realism - Each individual hair is hand-tied to the lace, creating the illusion that the hair is growing from your own hairline. Additionally, the fine lace front is so smooth and soft, youÂ'll never experience scratching or irritation. Never Unravels or Runs - SmartLaceâ"¢ is a welded lace, where every crossing of two threads is ultrasonically heated to adhere the threads to each other. Because of this strengthening feature, SmartLaceâ"¢ can be trimmed to fit your own hairline without risk of the material unraveling, stretching, or losing its shape.